The holidays are here! Time for cozy sweaters, hot chocolate, and lots of holiday lights. Festive holiday lighting has been a tradition for generations, and we understand why. Who doesn’t love some added sparkle on their home during the cold and dark winter months? So if you’re ready for some added cheer on your home, we’ve got some advice for you. Here at Night Vision Outdoor Lighting, we’re all for lights, but we want to make sure you do it right. So here are our top tips to light your home for the holidays. Before you can go about installing your amazing holiday lights, you need to make sure you have the right materials. The most important thing to be sure about is that you are using lights rated for outdoor use. Every strand of lights you buy should have a UL rating. The UL rating is published on the outside of the box as well as on a tag attached to the sting itself. Only use lights are rated for outdoor use. Using indoor lights outdoors can result in burned out lights, shorts, and even fires. Don’t do it! There are many types of outdoor lights available. The most traditional outdoor lights are C7 and C9 bulbs. They are the large cone-shaped bulbs that most people think of as Christmas lights. Both C7 and C9 bulbs use a standard candelabra screw-in base. The difference is that C9 bulbs are a little bit larger and easier to see from a distance than C7 bulbs. Both types of bulbs are available in many styles. First, you can choose whether you want multi-colored bulbs or just plain white. You can also select clear or frosted bulbs. In addition, some bulbs come with a textured finish. Strings of C9 and C7 bulbs will typically keep burning even if one bulb goes out. The bulbs screw in and out and are easy to replace. There is a reason why this is the most common and most traditional type of Christmas light. For added efficiency, you can use LED bulbs. LED versions of C9 and C7 bulbs are available at most home improvement stores. The upfront cost is a bit higher than the incandescent type, but the savings come quickly. First, LED bulbs will save you money in electricity bills. LED C9 bulbs, for example, typically use less than 1% of the wattage of comparable incandescent bulbs. The actual savings depend on the size of your lighting display, how many hours a day you have it lit, and how much electricity costs where you are. A rough estimate, though, points to an average savings of $100 or more per season. Add to that the fact that LEDs will last 50,000 hours compared to the 1,200 you get from incandescent bulbs and the savings in replacement bulbs add even more value. Another benefit of LED Christmas lights is that they are very durable. The old glass C7 and C9 bulbs broke very easily and shattered when they broke. LED lights give off much less heat, and so they usually have plastic casings, which don’t shatter and break much less easily. You can expect to spend much less time replacing burned out and broken bulbs than with incandescent bulbs. On average, emergency rooms see about 15,000 injuries a year are attributable to holiday decorating mishaps. Falling off a ladder or stepping on a broken Christmas ornament may be a cute joke in a movie. In real life, these accidents often result in a trip to the emergency room. Practice ladder safely. Always make sure that your ladder is firmly planted on the ground. Where the ground may be wet or icy, make sure that the ladder is not anywhere it can slip. The best idea, if you are not 100% of your ladder’s stability, is to have a spotter hold the base of your ladder. It’s also amazing how many injuries result from ignoring the warning printed on every consumer ladder: “Do not use top rung as a step” or something similar. The top rungs of a ladder are for your hands. If you are standing on the top one or two rungs, you have nowhere to lean and balance your upper body. They are also not meant to hold the weight of a person. It’s an accident waiting to happen. Also, avoid leaning ladders directly on gutters. Most gutters can’t support the weight of a person. When using extension cords outdoor, make sure that they are rated for outdoor use. The packaging should say something like “outdoor extension plug”. Also, make sure that you are using a ground fault circuit interrupter (GFCI) outlet. The outlets will shut off the circuit if there is too much current. This avoids overloads and fires. Also, make sure that you are not overloading a circuit breaker. If you use LED lights, this is rarely a concern. But if you are using incandescent lights, it’s best not to place more than 2 or 3 strings on a single outlet. If you want a beautiful light display without all the hassle, Night Vision Outdoor Lighting offers a holiday lighting service that will take care of everything. First, we will meet with you before the start of the holiday season to talk about your vision for your holiday lights. Some people just want some subtle white lights around their property. Other people want a more festive display of lots of colored lights. We’ll work with your dreams to design the perfect holiday lighting scheme for your home and property. Once the design is finalized, we will purchase all of the necessary materials. We’ll get your string lights, net lights, rope lights, wreaths, and anything else necessary to fulfill your vision. Once we’ve gotten all the materials and tested them to make sure every single bulb works, we’ll start on the installation. Typically, installation can be done in a single day, but we’ll take as long as necessary to do a great job. If a light goes out or there are any problems during the holiday season, we’ll come out and fix it. After the holidays are over comes people’s least favorite part of holiday lighting, taking it all down. Don’t worry, we’ll take care of that. 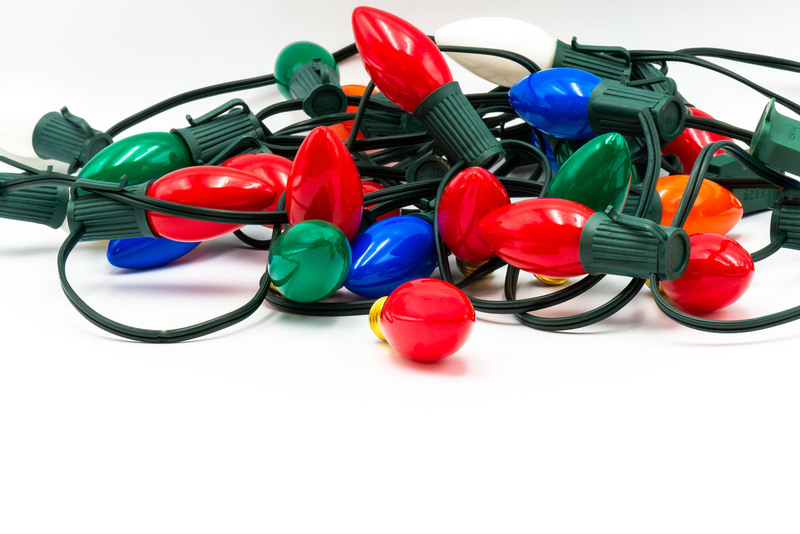 Our technicians will take down all of your holiday lights as soon as the season is over. We’ll pack everything away neatly. No more tangled lights at the beginning of the next season. Best of all, we’ll store everything for you for next year. You don’t have to think about it until next November. When the next holiday season comes, we’ll pull everything out of storage, test it all, and put it all back up for another festive season. If you’re ready to stop messing with tangled lights, we’re here for you. Give us a call to schedule your no-obligation free consultation to find out what we can do for you this holiday season.